If you are considering wearing a mask to protect against infections, there are two types you should know about. Facemasks are fairly loosely fitting, disposable masks approved by the U.S. Food and Drug Administration for use as medical devices. Doctors, dentists, and nurses often wear them while treating patients. These masks prevent large droplets of bodily fluids that may contain viruses from escaping via the nose and mouth. Facemasks also protect against splashes and sprays from others, such as those from sneezes and coughs. The downside is that these masks don’t prevent the inhalation of small, airborne contaminants. Respirators, also called N95 respirator masks, are designed to protect the wearer from small particles in the air that may contain viruses. They are certified by the CDC and the National Institute for Occupational Safety and Health. The name comes from the fact that they can filter 95 percent of airborne particles, according to the CDC. N95 masks are also often used when painting or handling potentially toxic materials. Respirators are selected to fit your face. They must form a perfect seal so that no gaps allow airborne viruses in. Healthcare workers use them to protect against airborne infectious diseases such as tuberculosis and anthrax. Unlike regular facemasks, respirators protect against both large and small particles. Overall, respirators are considered much more effective at preventing the flu virus than regular facemasks. Still, studies have found benefits to both types of masks. The CDC revised its healthcare setting guidelines for flu prevention to include facemasks and respirators in 2010. They recommend that healthcare workers wear facemasks when working with patients who have the flu. They also suggest offering facemasks to patients who show signs of respiratory infections. Respirators, however, are reserved for healthcare workers to wear during medical procedures. Facemasks can help reduce the spread of the flu — but only if they’re worn correctly and frequently. For example, several people were excluded from the results of the International Journal of Infectious Diseases study because they didn’t wear their masks properly or when they should have. Wear a facemask when coming within six feet of a sick person. Position the strings to keep the mask firmly in place over the nose, mouth, and chin. Try not to touch the mask again until you remove it. Wear a facemask before going near other people if you have the flu. If you have the flu and need to see the doctor, wear a facemask to protect others in the waiting area. Consider wearing a mask in crowded settings if the flu is widespread in your community or if you are at high risk for flu complications. When you’re done wearing the mask, throw it away and wash your hands. Never reuse a facemask. When it comes to the flu, prevention is still the best method of keeping yourself safe from this highly contagious virus. 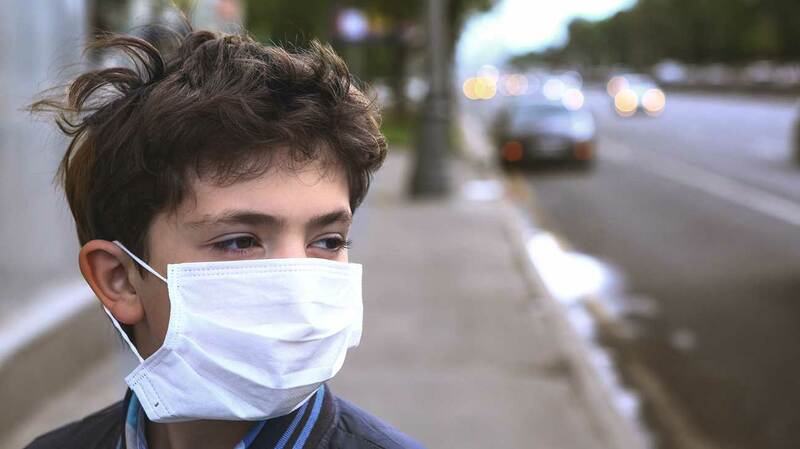 A facemask may offer added protection against getting sick. There are no known risks to wearing these devices, except for the cost of buying them. Masks do seem promising, but it’s also important to utilize other preventive measures, too. Make sure you wash your hands often during flu season — especially if you’re around others who may be sick. Also, be sure to get your annual flu shot to protect yourself and others from spreading the virus.